. : Getting ready to race a pursuit :: Ski XCOttawa.ca :: Skiing in Ottawa and Gatineau Park :. This workout is basically that same old interval workout where instead of simply changing terrain or the length of the effort/recovery to make it interesting, you change style. I know quite a few of you are wondering who would possibly train in a manner to be good in both styles in the same workout. Pursuit races are the answer to that. The concept of skiing a classic race and using those times as interval start times for a skate race the next day eventually turned into these two events being combined into one. And no, there is no determined break to change your equipment, it's just part of the race. This year alone there has already been 3 pursuit races on the NORAM cup and for the second year the format is coming to you as the XC Ottawa Invitational held at Nakkertok so it's worth practicing. Here's how to go about the workout. 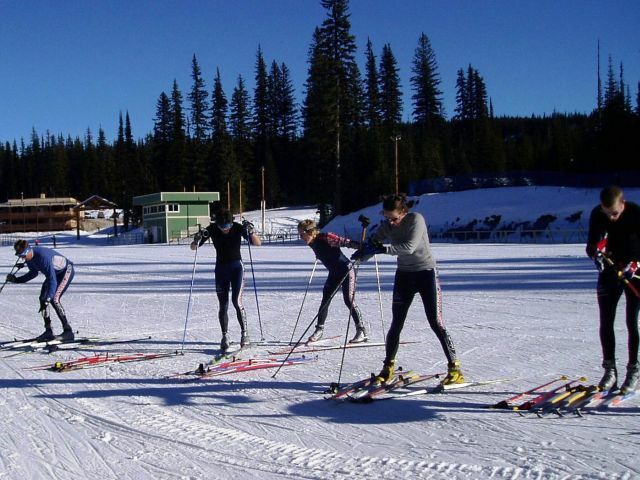 Prepare both skate and classic skis and bring them with both sets of poles to your training site. Use pursuit or skate boots for the entire duration of the workout. Do your warm-up in either style but do prepare yourself by doing a few exchanges. Although in races you will only switch from classic to skate practice both to save time and they aren't all that different in the end. Once you are comfortable and properly warmed up find yourself a loop where the is a fairly open area that can be used as an exchange zone without getting in another skiers' way. Set up the start of your interval such that you will reach the exchange zone near the end of the effort. Make sure that after the exchange you have time to put on your poles and ski a little. 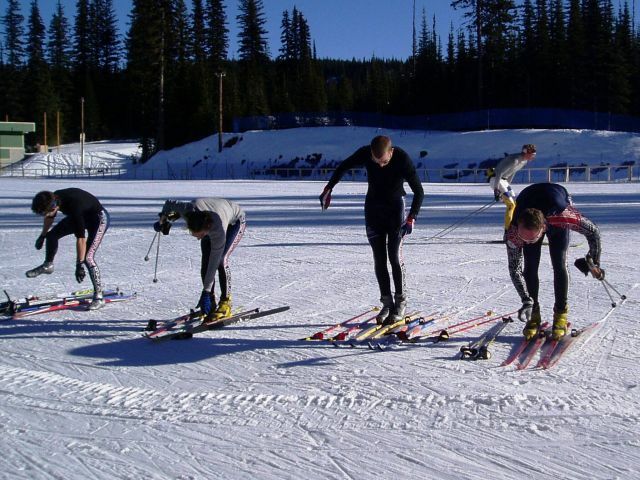 It is easier to do this with longer intervals and remember that part of your effort phase is spent in recovery (ski swap). 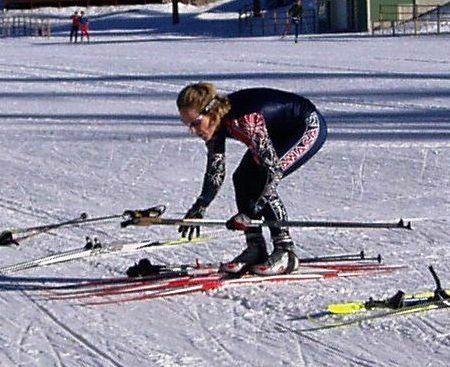 You do not need to ski at race pace for the entire interval but try and make it seem real before and after the exchange. Cool down and marvel at the improvements you've made in only one workout. If you set up the exchange near the end of the interval, it focuses on changing the equipment rapidly when you are starting to get tired and have you clumsy race hands. If you find you have trouble adapting to the second technique try putting the exchange zone in the middle so that you have enough time to practice this. When setting up the exchange zone line the extremities with coach ski poles. Between the poles you can skate even with classic skis so do as biathletes and remove the poles before you get to your skate skis. 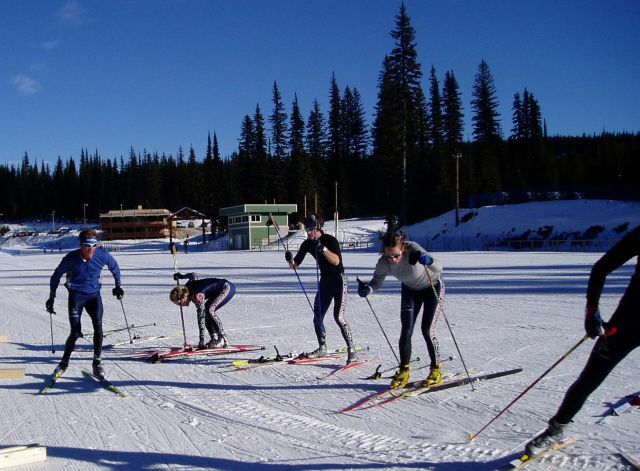 If you want a real race feeling do this workout with fellow skiers whom you like to compete with. Last note, when you are recovering come by and replace your equipment in the exchange zone. Try different configurations and use the best one in a race. Here are a few pictures of this workout in action..